Home » The Law & You » Debris From a Tractor-Trailer Hit My Car. What Can I Do? Debris From a Tractor-Trailer Hit My Car. What Can I Do? While following a tractor-trailer, a piece of debris came off the truck and hit the viewer’s windshield. The truck kept going. What can be done? Truck accident lawyers Greg Fellerman and Ed Ciarimboli offer legal advice. Dave Kuharchik: We’ve got a scenario involving a tractor-trailer accident on Interstate 80. 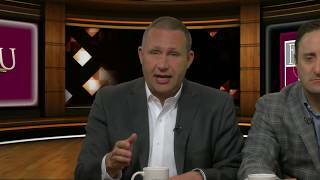 From the virtual law center tonight, we have back with us as always attorneys Greg Fellerman and Ed Ciarimboli. Good to see you guys. Ed Ciarimboli: Next week, we’re going to bring in actual, real miniature tractor-trailers and cars. Dave: We can do demos. Ed: We can do demos right here. Dave: Right here on the big law table in the new virtual law center. Dave: We’re taking our game to the next level. All right, here’s the advice tonight. This is a serious situation for Bill in Freeland. Bill says, “While following a tractor-trailer on 80 West, a piece of debris came off the truck and slammed into my windshield. The truck kept going.” So does Bill have any recourse here? He doesn’t specify about any damages. Ed: You don’t specify about any damages or whether in fact you were hurt or not. I’m assuming that you were otherwise you probably wouldn’t be asking us the question. If you got the license plate or anything of that nature, you can certainly hold the trucking company responsible. But absent of any information about the trucking company, if you’re hurt or there’s damage to your automobile, you’re going to have to go to your own automobile insurance for uninsured motorist insurance which this is called a phantom vehicle. I’ll let Greg tell you a little more about what you’re going to need to do. That’s why you have uninsured motorist coverage. Greg Fellerman: In phantom vehicle cases, we see a lot of them. Basically, you have a couple of requirements. You have to notify your insurance company within 30 days. You have to notify the police as soon as practical. File a report, that will protect you with the uninsured claim. The good news with these debris cases coming off a vehicle there are statutes that say that’s not supposed to happen. So if this does happen, they’re great cases. Pick up the phone and call us. Dave: All right and don’t forget if you need to call the guys, you can reach them at the number on your screen, check them out online. And of course, you know, if you watch it makes you feel like you’re right here in the office with Fellerman & Ciarimboli. Dave: The virtual law center. Ed: We got it all, Twitter, social media. Dave: Things are going up around here. Dave: Result matter, attorneys Greg Fellerman and Ed Ciarimboli. Guys, thanks so much.